Omar, indeed, has emerged as a figure among the global Muslim community to look up to and listen. “As-Salam-Alaikum!” Her greeting was met with cheers and applause from the crowd, and a prompt reply, “Wa’alaikum salam”. “Alhamdulillah Alhamdulillah Alhamdulillah,” She began her victory speech. “I stand here before you tonight, as your Congresswoman-elect, with many “firsts” behind my name. The first woman of color to represent our state in Congress, the first woman to wear a hijab, the first refugee ever elected to Congress and one of the first Muslim women elected to Congress,” she continued to a cheering crowd. When 37-year-old Democratic Congresswoman Ilhan Omar made an outstanding speech on November 7, 2018, after winning the election in Minnesota in the United States, it felt like she was rewriting a lot of predefined narratives. The outspoken young Muslim woman has, since then, drawn adoration and inspiration to an entire generation of Muslim women and men across the world with her bold principled statements and actions. Born in war-torn Somalia, Omar and her family fled the country when she was eight-year-old and spent four years in Dedaab refugee camp, one of the largest refugee camps in Kenya, before arriving in the United States at the age of 12. She taught herself English watching cartoons with English subtitles. Although Omar rose to the national stage only in 2016, after her win over a 44-year incumbent in the election to the state legislature, her love for politics had begun way back when she was 14-year-old. Omar made her grandfather participate in the local election process and acted as his translator. She then started managing city council campaigns and work as a senior policy aide for Minnesota politicians- a work she continued for years. Omar’s journey has, definitely, never been easy. “A lot of the elders, and mainly the women in the community thought it would be better if a man was representing us and if I take a back seat and support him. They would come and tell me, “you should let your brother have it,” she said. I reply to them, “I think I can do better job than my brother,” said Ilhan Omar in an interview to BBC. 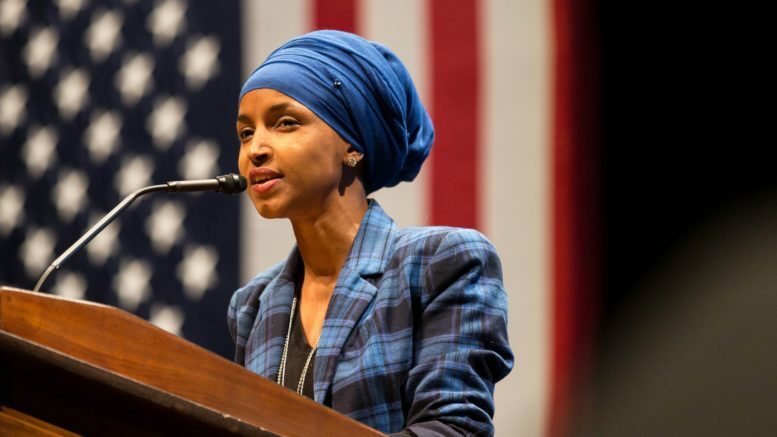 Muslim women across the world are full of pride to see this young bold Muslim female speaking truth to power and asking uncomfortable questions, ever since Omar sworn into the Congress on January 2019. Her rebuttal to President Trump’s statement that “Somali immigrants in Minnesota are Joining ISIS and spreading their extremist views”, couldn’t be more powerful – “Here in Minnesota, we don’t only welcome immigrants – we send them to Washington,” Omar said in her emotionally charged victory speech. Omar also stands out for her fearless and unapologetic nature. A video of Omar grilling Trump’s envoy on Venezuela, Elliott Abrams, for his record of genocide denial and war crimes apologia in the 1980s had gone viral on social media. For these powerful men, getting challenged by a young black Muslim refugee woman in a headscarf had been beyond their imagination. Omar sworn into the US House floor putting an end to a 181-year hijab ban. When asked  why she wears a hijab, Omar said it is “a choice I made to have a visual representation of my faith”. Her attitude evolved after 9/11. “I knew we had a responsibility to help shape a narrative about our faith that is positive.” For her, hijab thus became a marker of publicly embracing her faith in a political milieu where Islamophobia has become a fixture in public discourse. Ilhan Omar has found herself mired in controversy more than once over tweets about the American Israel Public Affairs Committee (AIPAC) and the influence of pro-Israel lobby money in American politics which ignited allegations of anti-Semitism. Omar apologized after condemnation from right and left alike, unequivocally, saying she was grateful to “Jewish allies and colleagues for educating me on the painful history of anti-Semitic tropes”. Her apology has been assessed as a mature one by many, wondering how many leaders are there who would step back and think through the criticism that they receive. Owning up to one’s mistake and willing to learn is a great sign- especially when leaders do that, there’s a lot of hope. She nonetheless reaffirmed “the problematic role of lobbyists in politics”. Omar went on saying, “I will not shy away of criticism of any government when I see injustice- whether it be Saudi Arabia, Somalia, even our own government”,  pointing out that she has been very critical of Saudi lobbyists and Saudi money in Washington D.C. and had even called for a boycott of Saudi Arabia after the murder of journalist Jamal Khashoggi- “But no one calls me Islamophobic because I’m Muslim,” said Omar. Ilhan Omar is a living embodiment of a socially and politically active Muslim identity that remains committed to ideals of social and political justice. “I know what my mission is. I know what my purpose is. I know that as long as I breathe I will continue to make people uncomfortable,” she said. Omar, indeed, has emerged as a figure among the global Muslim community to look up to and listen. Be the first to comment on "Ilhan Omar: An epitome of Muslim women’s political awakening"